Ha..... I finally got to be the first one to comment. Way cool to be shawl... Harry my Hero...... Glad to hear from you again. Please keep Fleegle in line. I know sometime she thinks she is the boss, but we know better. PS. Blue Cross / Blue Shield did deny my broken finger today because I was born with that finger and it therefore was a preexisting condition. I have had many complaints about your blog. It has been said that you are a thoughtful, knowledgeable, imaginative, amusing and creative writer. I have to agree with these observations. Beware - I am watching you. You are going to have a LOT of fun with that. Can't wait to see the yarn and the shawl! Gasp @ 628 yards per ounce. Sounds like a job for Super Fleegle!! That is going to be one fabulous shawl! Can't wait to see the spinning and the knitting. that shawl will be drop dead gorgeus! As I scrolled down and saw all those batts, I actually sucked in air. Your shawl is going to be GORGEOUS! That shawl will be spectacular with the changes in color! The Corgi Hill batts are perfect. It may take a long time but it will be well worth it! Those batts are gorgeous, and I can so see the gradation in that shawl - it will be lovely. Your posts always make me laugh. And laughs and humor are what I need now. Wow! Those are gorgeous. You better watch out to be sure Harry doesn't come visiting and spot them! It will be fabulous when done; I'll look forward to it :-). Have you decided to spindle-spin or use your Charkha? Oh drat....The Green Woman was peeking over my shoulder when I read your post, and now she's asking why we can't pretty please do something similar. Sigh. Seriously, it's going to be gorgeous, and it may be a long-term project, but I can't wait to see how it turns out! Oh...it's going to be a wicked shawl. Great idea. Oooh, the red-to-black transition is pure genius! I saw the batts arranged in a row and immediately thought, "Oooh yeah, that's going to be awesome!" Can't wait to see how it turns out. And am hoping the aliens don't make off with your fiber. I have a feeling that shawl is going to be beautiful. the spun yarn is going to be amazing! Kudos to Anna for doing such a great job! and kudos to you for taking on such a big project. My attention span is, alas, more like Harry's. I love that pattern! It's going to be totally amazing using those batts. Wow! AnnaMarie is a Fiber Goddess. That shawl is going to be stunning! dying it is really a good idea! Lovely colors! I bet you will get it spun up in no time. Do keep providing all of us a place to be jealous of your skill. You are an inspiration! Oh yes. This shawl is gonna be stunning! You do the most lovely things. And as for Harry's possible new job? I may want to get in on the action. my cat certainly seemed to think I was in distress every time I tried to sing. Oh that is going to be gorgeous. 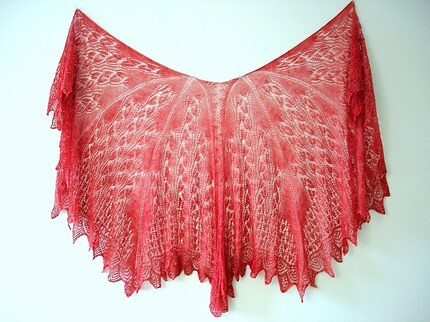 I have that pattern, and I just got some fiber from Anna, but only in one color, called True Blood. I'm glad you posted this. If I ever get it spun up properly, it would make a terrific shawl.